“World-Honored One, the cycle of birth and death [samsara] is based on the Tathagata-embryo. Because of the Tathagata-embryo, the beginning [of samsara] cannot be known. World-Honored One, if one says that because there is the Tathagata-embryo there is samsara, he speaks well. “World-Honored One, the cycle of birth and death means the cessation of the sense faculties and the immediate arising of new sense faculties. World-Honored One, the two dharmas, birth and death, are the Tathagata-embryo itself; they are called birth and death from the conventional viewpoint. World-Honored One, death means the cessation of sense faculties, and birth means the arising of sense faculties. The Tathagata-embryo, however, neither arises nor ceases to be, neither emerges nor vanishes; it is beyond the realm of [conditioned dharmas]. Unconditioned-samsara is Tathagata-garbha as soteriological principle. As soteriological principle it serves sentient beings entrapped in conventional and co-dependent samsara. In this sense It mirrors birth and death in the transcendent-field of the non-arising. As such It is beyond the conditioned environment of samsara but also mirrors the perfect suchness of the non-conditioned. 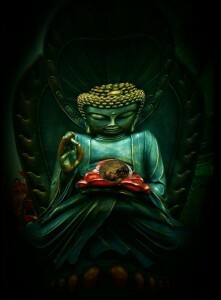 “World-Honored One, the Tathagata-embryo is permanent and indestructible. Therefore, World-Honored One, the Tathagata-embryo is the base, the support, and the foundation of the wisdom of liberation. It is also the base, the support, and the foundation of all conditioned dharmas. The Tathagata-garbha serves as the wisdom-support (soteriological principle) of beings entrapped in the conditioned-fields of samsara. In this sense it is the base-support of conditioned dharmas and does so unconditionally. “World-Honored One, if there were no Tathagata-embryo, there would be no abhorrence of suffering and no longing for nirvana. Why? The seven dharmas—the six consciousnesses and their objects—are momentary and non-abiding, and therefore cannot retain the experience of suffering. Hence, they are unable to abhor suffering or aspire to nirvana. The Tathagata-embryo has no beginning, neither arises nor ceases, and can retain the experience of suffering. It is the cause of [sentient beings] renunciation of suffering and aspiration for nirvana. The Tathagata-garbha as soteriological principle empowers sentient beings to discern the effects of samsara in light of the Buddhadharma; without this principle they would not have any recourse to rise-above samsara’s tide; It also serves as the aspiration for awakening the nirvanic-vehicle. “World-Honored One, the Tathagata-embryo is not a self, a personal identity, a being, or a life. The Tathagata-embryo is not in the domain of sentient beings who believe in a real self, whose thinking is confused, or who cling to the view of emptiness. The Bodhichild is not a composite of the five-skandhas, nor is it a phenomenal-domain in which a sentient being seeks refuge as in a void. “World-Honored One, the Tathagata-embryo is the store of the dharmadhatu, the store of the Dharma-body, the store of the supramundane, and the store of intrinsic purity. The Bodhichild, in stark contrast to its dark-twin (alaya-vijnana) that houses defiled-garbha, is a storehouse in the True-Essential Realm of the Dharmadhatu; it reflects and houses the intrinsic purity of the Dharmakaya. The inconceivable master of Bodhi bathes the Dharma-child of the Unborn with a radiant-light that is not detected by defiled sensate phenomena which is always kept at bay. Thus the Tathagata-garbha is the domain of unsoiled and Supra-essential Light. The Tathatic-Eye alone can witness the developing gotra in the seedbed upon which the Dharma Itself takes root and continually nourishes and guides this Luminous Child. Then the Buddha praised Queen Śrīmālā, saying, “Splendid, splendid, just as you say, it is difficult to know and understand how the intrinsically pure mind can be contaminated by defilements. ” Śrīmālā, there are two things difficult to understand. What are the two? First, the intrinsically pure mind; second, the contamination of this mind by defilements. Only you and those Bodhisattvas who have already accomplished the great Dharma can accept these two things upon hearing of them. The Sravakas can understand them only through faith. The Garbha of the Tathagatas is essentially pure and devoid of all defilements; yet, in Its base as soteriological principle, it washes away all defilements (through the awakening power of bodhicitta) from the soiled minds of sentient beings. “Śrīmālā, if my disciples strengthen their faith and comply with the Dharma-wisdom, then they will reach the utmost [understanding] of this Dharma. Compliance with the Dharma-wisdom means: contemplation of the sense-organs, the consciousnesses, and their objects; contemplation of karmas and their results; contemplation of the dormant defilements of the Arhats; contemplation of the joy of a liberated mind and the bliss of meditation; and contemplation of the noble, miraculous powers of the Sravakas and Pratyekabuddhas. By accomplishing these five skillful contemplations, my present and future Sravaka followers will, because of their strengthened faith and their compliance with the Dharma-wisdom, be able to understand the intrinsically pure mind and how it becomes contaminated by defile-ments. They will reach the utmost [understanding of this Dharma], Śrīmālā , the utmost [understanding) is the cause of the Mahayana. The true sons of the Tathagata are 1) possessed of faith, and then 2) controlled by faith; they then 3) by depending on the light of faith gain a knowledge in the precincts of the Law and finally 4) reach certainty “in this.” According to Chi-tsang (p. 278), there are two levels of faith: the disciples begin with faith in the teaching, and then advance to faith with understanding. (In the Abbidharma-kosa, “faith with understanding” is of four kinds, toward the Buddha, his Doctrine, and the Congregation, and toward the moral rules dear to the noble ones.) Then there are two levels of Dharma-knowledge: the disciples by depending on the light of faith gain a knowledge in the precincts of the Dharma, which is their breadth of knowledge; then they reach certainty, which is their depth of knowledge. Saeki (p. 3o5) tries to correlate the four levels with the Bodhisattva Stages: the one with simple faith precedes the Bodhisattva stages; the next one who adds understanding is on the First, Second, and Third Stages; the one who gains the knowledge in the precincts of the Dharma is on the Fourth, Fifth, and Sixth Stages; the one who reaches certainty is on the Seventh or higher Stage. In terms of the Sri-Mala’s subsequent three kinds of good son or daughter of the family, the one “who shrinks from gaining the knowledge of the profound Dharma by himself” is on the first two levels of discipleship. The one with the knowledge in the precincts of the Dharma is of course on the third level; and the one who has the profound Dharma through introspection is on the fourth or final level. All in context with Wayman’s above footnote. A lot is packed into this declaration of war (a second aspect of Queen Śrīmālā’s Lion’s Roar) against those who undermine or who attempt to blatantly soil the Buddhadharma. This is in reference to the philosophers (as mentioned in the Lankavatara Sutra), the demigods of mara’s dark retinue, the asuras (jealous gods), but especially the rotten-hordes of icchantikas whose dubious disregard for the Buddhadharma is the result of despoiled seeds blown-about on the karmic-winds of delusion. After Queen Śrīmālā had thus spoken, she and her retinue bowed down at the feet of the Buddha. This is based on the same motif described earlier in the series, (The Illustrious Way), in that her spirit, like Vimalakirti’s, emanates from an Extra-Supernal Buddhafield. Then the World-Honored One emanated a magnificent light illuminating the entire assembly, and elevated himself into midair to the height of seven palm trees. Using his miraculous powers, he walked in the air and returned to the city of Śrāvastī. Meanwhile, without taking their eyes off the World-Honored One for an instant, Queen Śrīmālā and her retinue gazed at him with adoration until he passed out of sight. Then they all danced with joy and exchanged praises of the virtues of the Tathagata. Recollecting the Buddha single-mindedly, they returned to Ayodhya. When she had returned to the city, Śrīmālā persuaded King Mitrakirti to establish the Mahayana [as the state religion]. She taught the Mahayana to all females of the city over seven years of age, and King Mitrakirti taught the Mahayana to males over seven; as a result, all the citizens of the country, without exception, learned the Mahayana. *This most likely is an added redaction intended for the audience of the day, when the Mahayana was the state religion. When the World-Honored One entered the Jeta Grove, he called the Venerable Ananda. He also summoned the king of devas by thinking about him. In response to the Buddha’s summoning thought, Śakra, the king of devas, and his retinue instantly appeared before the Buddha. Śakra; Kauśika: both titles of Indra. Kauśika is used as a direct address of Indra by the Buddha. He then told Ananda, “You, too, should accept and uphold this sutra and explain it in detail to the four kinds of devotees. Ananda: the Buddha’s cousin and premier disciple. The following litany by the Blessed One is essentially an outline of the major themes covered in this sutra. All in all, they encapsulate the Great Lion’s Roar that best captures the spirit of those who faithfully adhere to the principles of the Mahayana. The Buddha said, “This sutra is called ‘Acclamation of the Tathagata’s True Virtues,’ and should be upheld accordingly. “It is also called ‘A Discourse on the Ten Inconceivable Vows,’ and should be upheld accordingly. “It is also called ‘A Discourse on the One Great Vow That Comprises All Vows,’ and should be upheld accordingly. “It is also called ‘A Discourse on the Inconceivable Embracing of the True Dharma, and should be upheld accordingly. “It is also called ‘A Discourse on the Entry into the One Vehicle,’ and should be upheld accordingly. “It is also called ‘A Discourse on the Boundless Truth,’ and should be upheld accordingly. “It is also called ‘A Discourse on the Tathagata-embryo,’ and should be upheld accordingly. “It is also called ‘A Discourse on the Buddha’s Dharma-body,’ and should be upheld accordingly. “It is also called ‘A Discourse on the Hidden Reality in the Doctrine of Emptiness,’ and should be upheld accordingly. It is also called ‘A Discourse on the One, Ever-abiding, Immovable, and Quiet Refuge,’ and should be upheld accordingly. “It is also called ‘A Discourse on Inversion and Reality,’ and should be upheld accordingly. “It is also called ‘A Discourse on the Intrinsically Pure Mind Wrapped in Defilements,” and should be upheld accordingly. “It is also called ‘A Discourse on the True Sons of the Tathagata,’ and should be upheld accordingly. “It is also called ‘A Discourse on the True Lion’s Roar of Queen Śrīmālā,‘ and should be upheld accordingly. Then, hearing what the Buddha had said, Śakra, the king of devas, the Venerable Ananda, and all the gods, humans, asuras, gandharvas, and others in the assembly were jubilant. They accepted the sutra with faith and began to practice it with veneration. This entry was posted in The Lion's Roar of Queen Śrīmālā and tagged bodhichild, defilements, Dharma, faith, Queen Śrīmālā’s Lion’s Roar, soteriological principle, Tathagata, The Heaven of the Thirty-Three, Unconditioned-samsara. Bookmark the permalink.